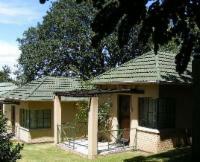 Lake Chrissie Lodge is situated in the quaint town of Chrissiesmeer, in Mpumalanga’s central grass and wetlands. The guest house comprises of 11 bed and breakfast rooms and two self-catering units, which all feature en-suite bathrooms, DStv, and bar fridges; while the self-catering units furthermore feature open-plan lounges and kitchens. The lodge also offers guests braai facilities and parking on the premises.Guests can explore some great attractions in and around the area, such as the Badplaas Golf Club and the Nooitgedacht Dam Nature Reserve. My friend and I were given the key to our chalet and were massively disappointed, when we saw the room with the requested two single beds and sparse 70's furniture and TV. There was no basin and no shower in the bathroom as advertised, just an old bath with a broken tap and a toilet. The curtain as well a bed sheet were torn. Since it was late and we were staying for one night only, we decided to bear with it. This place seriously needs some major renovation and upgrading. Not worth a return visit. It wasn't very bad, it is not the spot in the picture though. A lot of peacocks or guinea fowl or ducks keeps you awake during the morning hours. If that changes the stay would have been fine. I booked a room for a friend. I was very disappointed with this lodge. It most certainly isn't a four star lodge as advertised. More like a one or two star. Yuck. We thourougly enjoyed our stay en will go back in the future. Lake Chrissie Lodge is 1.1km from the centre of Chrissiesmeer , the nearest airport 140.2km (Kruger Mpumalanga International Airport).